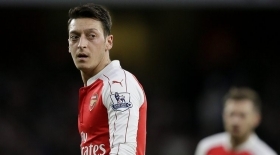 Mesut Ozil on the move? Atletico Madrid have reportedly lodged a bid in the region of £18m to prise away midfielder Mesut Ozil from Arsenal before the end of the month. Ozil's future with the north London giants appears uncertain amid reports that he has fallen out-of-favour with manager Unai Emery. According to El Gol Digital, the German is currently attracting interest from Atleti, who are aiming to shore up their attack to challenge for the La Liga crown with Barcelona. It is added that the Madrid giants would be willing to part with a sum of £18m to pursue him from the Gunners, although his £350,000-a-week remains a major stumbling block. Ozil was left out of the matchday squad for the recent Premier League defeat at West Ham United and following the game, Emery hinted that the German did not deserve to make the trip. Despite this, he could make a comeback for the upcoming London derby against Chelsea, which may make or break the Gunners' prospects of finishing in the top four. Arsenal are currently six points behind Chelsea in the pursuit of the final Champions League spot and they cannot afford to fall further behind when they face each other this weekend.